Brain Tuners set of 5 tuning forks are based on brain wave studies using electroencephalography (EEG) technology to map different states of consciousness known as Delta, Theta, Alpha, and Beta. The binaural beat gently signals the brain to shift into a different state of consciousness. 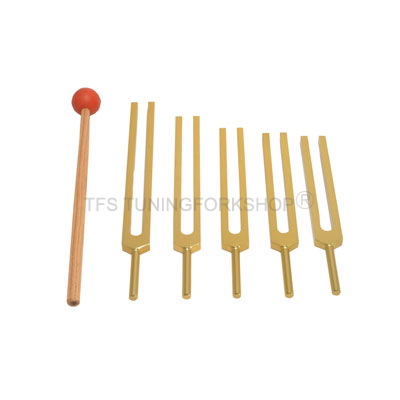 Brain Tuners (set of 5 tuning forks) are produced on the basis of studies of brain wave. EEG or Electroencephalography technology is used to construct various states of consciousness namely Delta, Theta, Alpha, and Beta. The Brain Tuners are stroked together (one each in the 2 different ears).The 2 parts of the brain join the 2 sounds to create a third, different sound called a binaural beat. The difference between the two frequencies must be small for the effect to occur; otherwise, the two tones will be heard separately and no beat will be perceived. When the Fundamental Brain Tuner tuning fork is sounded with any of the 4 Brain tuning forks, the difference between the two tuning forks creates a binaural beat which can be heard as a pulsation.Binaural beats reportedly influence the brain in more subtle ways through the entrainment of brainwaves and can be used to produce relaxation and other health benefits such as pain relief. Binaural beat stimulation has been used fairly extensively to induce a variety of states of consciousness, and there has been some work done in regards to the effects of these stimuli on relaxation, focus, attention, and states of consciousness.